It’s been in the air for quite some time now, but Roskilde Festival has finally made the decision with days to go before the gates open to fans. And it’s good news for those who enjoy football as well as music because festival organisers revealed today that they will indeed be showing all the World Cup games from Saturday June 30 until the end of the festival. 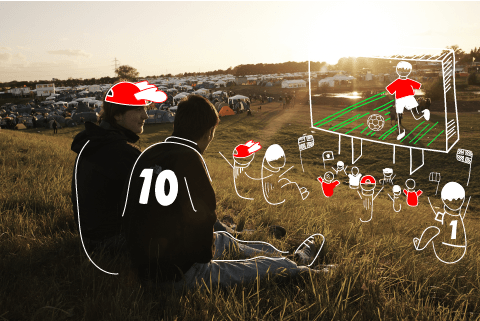 “Watch the World Cup at Roskilde Festival 2018. We’re happy to announce that we will be showing all World Cup games on a huge screen in East City,” Roskilde Festival wrote on Facebook. Eight last-16 matches will be shown this coming Saturday, Sunday, Monday and Tuesday, which are so-called warm up days at the festival, while four quarterfinals will be shown the following Friday and Saturday, while the festival is in full swing. Denmark fans will thus have a chance to see their team in action should they progress from Group C today. Should the Danes beat France and win the group, Denmark will play the second placed team from Group D – likely one of Nigeria, Argentina or Iceland – on Saturday at 16:00. In case of a draw or Peru not losing to Australia, the Danes will face Group D winners Croatia on Sunday at 20:00. An Australia win coupled with a Denmark loss will see a lot of disappointed football fans at the music festival.